It has been my experience doing science workshops that children learn best through a hands-on lesson. This is especially true with intellectually challenged students. They usually excel in hands-on activities. Here is a lesson plan for the assembly of a multiplication of force apparatus for students in grades 6 to 12. 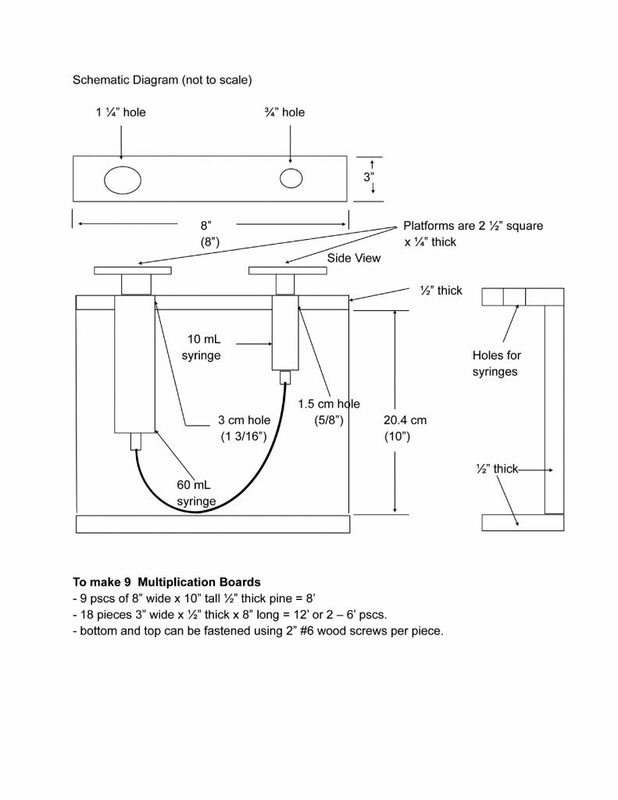 Students will assemble the multiplication toy and the various weights, take measurements and make observations regarding the multiplication of force. The multiplication of force in a pneumatic (gas) or hydraulic (liquid) system is made possible by using an output piston that is larger than the input piston. I prefer “output” and “input” or “primary” and “secondary” to describe pistons rather than “master” and “slave” for obvious reasons. I measured the diameter of both the 10 mL syringe and the 60 mL syringe. – area = 3.1416 x 0.75 x 0.75 = 1.76715 cm2 7.086 divided by 1.76715 = 4. The 60 mL syringe is 4 times larger and can lift 4 times the mass compared to the smaller 10 mL syringe. If we put a mass of 400 g on the 60 mL syringe, it should be lifted by 100 g of mass on the 10 mL syringe. This is the multiplication of force. The trade off to the output’s multiplication of force is a decrease in the larger piston’s movement. • 18 pieces 3” wide x ½” thick x 8” long = 12’ or 2 – 6’ pieces. • Bottom and top can be fastened using 2” #6 x 32 wood screws per piece. Schools that do not have weights can make their own. Using a triplebeam balance (like Ohaus ®), measure the following masses of plasticine: 25, 50, 100, 200, 400 g. Make 9 of the 400 g, 18 of the 200, 18 of the 100 and 30 of both the 50 g and 25 g. When weighing the plasticine, make it 1 or 2 g less than the desired weight. Wrap each weight in duct tape. The tape will make up the difference in weight. 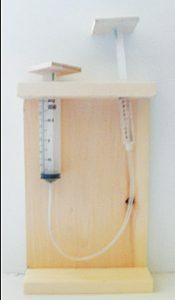 • Students make weights of 25, 50, 100, 200 and 400 g.
• Instruct your students to ensure the 60 mL syringe is completely pushed in and to place the 400 g mass on it. • Instruct them to put a 100 g mass on the 10 mL syringe. • Instruct them to add more of the mass pieces to the 10 mL syringe until the 400 g mass is lifted by the 60 mL syringe and to record their answers. • Have your students do a comparison of the pneumatic system with various hydraulic systems (see Chart of Multiplication of Force). • Optional: have your students design their own multiplication of force toys. • Which of the 5 systems seem to work the best? • What are some possible reasons that more than 100 g of mass on the 10 mL syringe were required to lift the 400 g on the 60 mL syringe regardless of the type of fluid system used? Taylor, Stanley R. Taylor’s Pneumatic Toys. Leaskdale, ON: Stanley R. Taylor, pub., December 24, 2012. Canadian Fluid Power Association. cfpa.ca/HOME/default.asp. NFPA Fluid Power Challenge for Grade 8s. nfpafoundation.org/FPChallenge/Index.aspx. 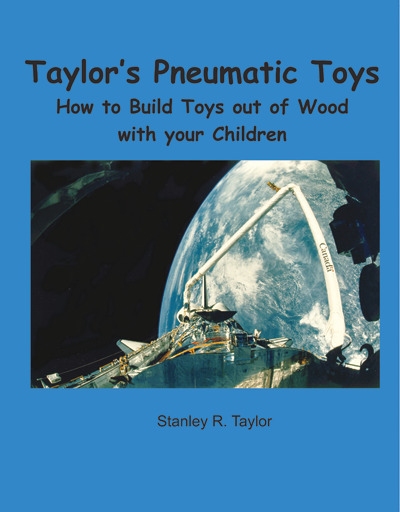 Stan Taylor is the author of a book entitled Taylor’s Pneumatic Toys, now for sale on Kidder Scientific, STAO Store, Chapters/Indigo, Amazon and Barnes & Noble. Stan blogs at: stanleyrtaylorcommunications.blogspot.com/.